Ms. Laura E. Owen, President and Chief Operating Officer, ICOP Digital, Inc. (http://www.ICOP.com/ ) (NASDAQ:ICOP), said, "Some recent developments include another state contract win for ICOP. In mid-April, ICOP was awarded the Texas Department of Information Resources (DIR) state contract for digital in-car video, allowing all state, county and municipal law enforcement agencies, and schools, to purchase our mobile video solutions in the most efficient manner, as it extends the pricing, terms and conditions of the State contract to state and local agencies. This contract is also available to agencies and schools outside of the state of Texas , and is an important win for ICOP, given the fact that Texas is the largest consumer of in-car video in the US . The US Patent and Trademark office issued ICOP the patent on mobile live streaming. This patent creates a high barrier to entry for our competition. Specifically, our patent provides for real-time communication of video, and other surveillance related multimedia data, by live streaming of video and other data from an emergency response unit, to a variety of devices. The ICOP LIVE™ functionality is an indispensable tool for agencies to use for situational awareness, tactical oversight, and interagency interoperability. Agencies will be able to more effectively assess a situation remotely, and take appropriate action including deploying proper resources for the incident. Senior command will also be able to provide tactical oversight of events sooner, both remotely and while en route, with the addition of ICOP LIVE on-scene video and audio. In fact, Sprint, our long-standing co-marketing partner, recently added greater national attention to ICOP LIVE. They recently launched a national print ad campaign to 160,000 law officers across the nation, promoting the power of the Sprint 4G network, with emphasis on how ICOP LIVE can help secure a community. As a result, we are now responding to requests by several agencies to trial ICOP LIVE. Looking abroad, our relationships in Saudi Arabia continue to progress and build momentum. Last week, we learned that ICOP was included in a report about the Saudi Security industry. In addition to emphasizing that Saudi Arabia “maintains one of the world’s fastest growing markets for safety and security solutions, equipment, and systems, with a budget allocation of $36.2 billion in 2009”, the report highlighted five key technology developments in Saudi Arabia, in 2009. ICOP was listed as 1 of the 5 featured technologies. The report stated, “The Ministry of Interior recently tasked ICOP Digital with outfitting Saudi Arabia ’s security force vehicles with digital video systems.”You can find this report posted on our website, http://www.icop.com/documents/ASIS_Security_Report_Secure.pdf , in our “Library”. SecurityStockWatch.com: Now that 2009 has come to a close, how are things looking for ICOP; did the Company meet expected goals for the fourth quarter? How is 2010 shaping up so far? Laura Owen: Yes, Q4 gave us a strong close to 2009, and our sales pipeline for 2010 is exciting. As we look back over the year, it really is amazing what we were able to accomplish, given the tough economic environment we’re in. Looking abroad, we established ICOP as the exclusive provider of in-car video to the Ministry of Interior in Saudi Arabia in 2009, and we expanded our presence in the Mexico market. We announced a worldwide strategic partnership with Raytheon Company, a Fortune 110 company; launched our laptop integrated product, the ICOP 20/20 VISION™; and completed a capital raise of over $3 million. We believe things are lining up very well to have a positive outlook for 2010! ICOP has just learned that the US Patent and Trademark Office allowed us a new patent. The patent is entitled “SYSTEM AND METHOD FOR COLLABORATING EMERGENCY RESPONSE EFFORTS THROUGH MULTIMEDIA DATA DISSEMINATION”. Specifically, the patent is directed to an apparatus for sharing and communication of video and other surveillance related multimedia data, by live streaming of video and other data from an emergency response unit to a variety of devices and other emergency response units. Multimedia data is wirelessly disseminated from a first response unit, to any number of playback devices on a network. ICOP LIVE™, developed by ICOP Digital, Inc., has implemented this system and method. The ICOP LIVE functionality is an indispensable tool for agencies to use for situational awareness, tactical oversight, and interagency interoperability. Agencies can more effectively assess a situation remotely, and take appropriate action, including deploying proper resources for an incident. Senior command is able to provide tactical oversight of events sooner, both remotely and while en route, with the addition of ICOP LIVE on scene video and audio. When a major event occurs, such as a traffic accident involving a chemical spill, the police agency can provide the ICOP LIVE video stream to all other agencies involved, enabling a faster and safer resolution to the crisis. Also, ICOP LIVE helps enforce one of ICOP’s core foundations of improving officer safety. When video is streamed back to headquarters with ICOP LIVE, the officers involved in the event are safer because they do not have the distraction of providing detailed audio narratives back to headquarters, and can concentrate all of their efforts in accomplishing their mission at hand. Given the importance of this technology and its potential impact on surveillance and public safety in general, we are very pleased to have many trial installations already in progress, across the United States and abroad. Many other upgrades to our core product and backend software have been made as well. In 2009, ICOP released an “802.11n” wireless upload solution, which provides upload speeds up to four times faster, versus the older industry-standard “802.11g” technology. In addition, we now support solid-state media for our products, giving the customer more options and flexibility when designing a solution. Included in the Saudi deployment was integration between the ICOP Model 20/20®-W and EyeNet, a provider of License Plate Recognition (LPR) technology. EyeNet is the only provider of LPR technology that operates in Arabic. The Company also successfully launched the ICOP 20/20 VISION™, its new laptop-based solution. It has been very well received by the law enforcement community, and has already resulted in several significant sales orders. ICOP delivered several important upgrades to the backend software, even supporting Windows 7, the day it was released by Microsoft. We had a strong finish to the fourth quarter with our total revenue again trending up, quarter over quarter, for the third consecutive quarter. The average size of each order is trending up, as well. ICOP has always enjoyed a loyal customer base and we have seen that loyalty continue to grow as more agencies return to ICOP for follow-on orders to equip their fleets. Many companies have struggled to stay afloat during these tough times, and some of our direct competitors have not survived. We know we are very fortunate to have weathered the storm and finished the year in an uptick. Looking to 2010, we are expecting this growth to continue, as our domestic and international sales pipeline continues to expand. SecurityStockWatch.com: We saw in recent news that ICOP is seeing greater success in the fourth quarter of 2009 Laura; can you give us an update on current developments at ICOP? Laura Owen: We feel very fortunate to be experiencing growth at ICOP, both in Q4 2009, and 2010, at a time that our national economy continues to struggle. We are seeing our hard work begin to pay off for us. Earlier this year, we began to pay more attention to larger agencies, while never forgetting the importance of small and midsize agencies to our success. A perfect example of this success is a recent sale where ICOP received a $270,000 order for ICOP Model 20/20®-W systems from a major metropolitan area in the Southeastern U.S. This order was the third order received from that particular law enforcement agency. With a total of 350 cars in their fleet, they have now equipped 47% of their total fleet with ICOP units. Our strategic partnership with Raytheon continues to move forward with the near completion of our National Road Show Tour during which Raytheon dealers and representatives were introduced to the relationship and trained on how to position and sell the ICOP solution in nine cities across the U.S. Raytheon has made a tremendous commitment to educate their channels about ICOP. They have featured ICOP prominently in several of their newsletters that can be accessed from Raytheon’s website at http://www.raytheon.com/businesses/ncs/civilcomms/. ICOP was provided with the opportunity to share our story in several publications recently. 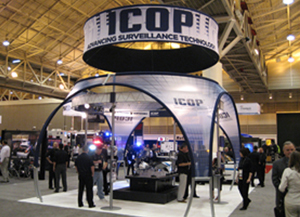 Bob Bradley, ICOP’s Director of National Sales and Marketing, was interviewed by PoliceOne at the 2009 International Association of Police Chiefs conference in Denver , CO . The interview, captured on video, was published in their online newsletter: http://www.policeone.com/law-enforcement-newsletter/Week-466-December-02-2009. I had the pleasure of speaking with WomenEntrepreneur.com about our international expansion. The interview can be accessed at http://www.womenentrepreneur.com/2009/12/increase-sales-and-income-through-exporting.html. We concluded a successful close for our ICOPZ warrants, which expired on December 2, 2009, with most of the warrants being exercised. This brings the resources necessary to fund inventory purchases and support operations as we continue to execute against our business plan. At the conclusion of the exercise period, 7,293,583 warrants were converted to common stock, bringing in $3,063,305 to ICOP. Laura Owen: Thank you. We were pleased by the vote of confidence expressed by Billings , by placing this order, our largest to date for the ICOP 20/20 VISION™. We believe this validates the strength of our laptop-operated product and paves the way for future success for this solution. We are also very encouraged to see Stimulus Funds beginning to flow to agencies, allowing them to move forward with planned purchases. Our timeliness in getting in front of these programs to assist agencies with applying for funds is paying off for us now. We are very excited about the opportunity ahead of us in the fourth quarter of this year, and into 2010. Looking ahead in the mobile video market, we have a substantial pipeline driven by our partnership with Raytheon, in addition to our growing success in the international markets. In fact, we recently filed a Shelf Registration with the SEC to give us the ability to efficiently fund our financial needs as we carry out our business plan. While we have no current plans to raise capital at this time, the Shelf Offering provides us with an economical vehicle to fund inventory purchases and have the working capital needed, as we gain sales traction with our strategic partners and existing sales channels. Our partnering relationship with Raytheon continues to progress. The Raytheon channel is ramping up nicely. They have completed nearly half of their National Road Show Tour, with excellent attendance and interest from both the Raytheon dealers and customers. The Raytheon pipeline is building, as their channel partners are getting up to speed. We are working with Raytheon on several large opportunities, leveraging Raytheon’s customer relationships, in addition to their ability to serve as a prime contractor. We are optimistic that these efforts will really pay off in 2010. SecurityStockWatch.com: Laura, it’s been a few months since we first spoke to you about ICOP. Can you give us an update on current developments with your company with respect to sales, products and/or strategic relationships with companies such as Raytheon? Laura Owen: We are all very excited about the recent momentum and traction we are experiencing with our new partner, Raytheon. For those who have been watching our news announcements, they will have seen that we successfully booked our first sale with Raytheon in the Military market. The sale to the 88th MP Detachment in Camp Zama, Japan was strategic in that this marks the first win for the ICOP/Raytheon partnership. In addition, this expands our presence further across the globe into a new region. Other activities in support of this relationship include our participation with Raytheon, to showcase our live streaming product ICOP LIVE™ at this month’s International Association of Chiefs of Police (IACP) 2009 Conference in Denver, CO, utilizing both the ICOP booth and the Raytheon booth. The live streaming application was also delivered at the show for demonstration purposes in conjunction with our co-marketing partner, Sprint. In addition, we are on the cusp of launching our 10-city National Road Show tour with Raytheon with the first city scheduled for October 8, 2009. These meetings will be open to law enforcement officials to introduce them to this new partnership, and to familiarize them with the ICOP product line, as well as to provide some guidance and support with regard to in-car video projects in general. The second half of the day will be spent training Raytheon dealers and manufacturer’s representatives on the entire ICOP product line, furthering their ability to be successful in selling our solution. I would also like to take this opportunity to share another recent experience. On October 6th, we were selected by Fox Business Network to be the first company featured on their new segment entitled “Focus on Entrepreneurs” , a new feature on the “Americas Nightly Scoreboard Show. The recorded interview can be accessed from the Fox Business website at the following link: ICOP on FOX News. (Note: You may have to copy and past the following link into your browser: http://video.foxbusiness.com/10401050/small-business-helps-law-enforcement?category_id=c5395eedbdcac73d74d7e1502a7840192913efb0). SecurityStockWatch.com: Thank you for joining us today, Laura. We are honored to have with us the first woman appointed Secretary of Commerce for the State of Kansas. Please give us an overview of your background. Laura Owen: Thank you for this opportunity to share the ICOP story! I’m happy to be with you today. Yes, it certainly was an honor to serve as Secretary of Commerce for the State of Kansas. In many ways, this public service experience helped to prepare me for what we do at ICOP – we provide tools for those who serve and protect our communities. This experience also provided me a greater appreciation for those men and women who serve and protect our nation every day – both our military and first responders. Prior to working in the security industry, most of my career was in finance, working in financial consulting and investment banking. I also owned and operated a couple of small businesses. SecurityStockWatch.com: One can read in ICOP news announcements that, ICOP Digital is a leading provider of mobile video solutions for Law Enforcement, Fire, EMS, and Military markets, worldwide. ICOP solutions help the public and private sectors mitigate risks, reduce losses, and improve security through the live streaming, capture and secure management of high quality video and audio. ICOP emphasizes that, “Without local security, there is no national security.” We couldn't agree more. Please give us an overview of ICOP products. Laura Owen: Since the launch of our flagship product, the ICOP Model 20/20®-W digital video recorder, ICOP has continued to pioneer video solutions that materially advance the security of communities. ICOP is broadening its scope and presence across multiple markets through its direct and indirect sales organizations and key strategic partners. The ICOP Model 4000™ was developed to meet the needs of other public safely and transportation markets, to include Fire/EMS and Cash Transit. ICOP recently launched the ICOP 20/20 VISION™ for law enforcement, which takes the rich features and functionality of the ICOP Model 20/20-W, and enables the officer to operate the unit from the laptop in the vehicle. This capability is of growing importance to many law enforcement agencies, especially large agencies, where over 90% of vehicles operate laptops in the vehicle. Recorded video evidence is downloaded and stored on a server, where video files can be securely stored, viewed for training purposes, and copied for court. ICOP offers a couple of options for this “back-end” software, to include a powerful enterprise solution, which uniquely enables sharing of video files across the city or across the nation. We also developed a product called ICOP LIVE™. I believe this product has the potential to optimize the outcome of a crisis more than any other law enforcement product on the market today. ICOP LIVE enables the live streaming of video to a virtually unlimited number of simultaneous viewers, over any method of wireless transmission, using high levels of security. SecurityStockWatch.com: When you roll it all up, what is the approximate market size of opportunities which ICOP is focused on? Laura Owen: There are many studies that attempt to define the size of the video market. Some are more accurate than others. The bottom line is that as we look around each day, we realize we are surrounded by cameras in every facet of our lives. Our office buildings, banks, schools, malls, - and now even our streetlights, have cameras. That said, there is a lot of momentum in mobile video products. There are approximately 440,000 police cars, just in the U.S. Of those 440,000 vehicles, 50% currently have in-car video systems, and a vast majority of these units are VHS tape systems that desperately need to be replaced. So our #1 opportunity is meeting the needs of agencies in replacing their antiquated systems, in addition to serving the growing number of cities who are adding video to their fleets, for the first time. SecurityStockWatch.com: Law enforcement is obviously a huge market opportunity for ICOP. Are there other market key target markets for ICOP solutions? Laura Owen: Yes, Law Enforcement is a market where we have a solid market presence. Other key target markets for ICOP include military, Border Patrol, Fire and EMS, and Cash Transit. Most of these markets are a natural progression for us as they fall under the umbrella of Public Safety. SecurityStockWatch.com: Congratulations on the recent Press Release issued by Raytheon which announced a partnership with ICOP Digital to market ICOP’s mobile video solutions to its public safety, transportation and military customers. Raytheon had revenues last year of $23.2 billion and has a market cap of $18 billion – so, that’s very impressive “win” for ICOP. Care to elaborate on what this deal means for your company? Laura Owen: It is a very exciting time for ICOP. Last month, we entered into a five-year agreement to enable Raytheon to market ICOP’s industry-leading mobile video solutions to its public safety, transportation and military customers in the US and around the world. Our partnership with Raytheon positions us, together, as the largest provider of mobile video systems. This relationship brings ICOP’s experience as a leader in mobile video solutions, together with Raytheon’s market presence and expertise as a technology and innovation leader. Together, we will provide solutions that mitigate risks, reduce losses, and improve safety and security for the markets we serve. Raytheon’s expertise as a systems integrator is important in positioning our solutions around the world. We have completed training the Raytheon Sales leaders, and they have already begun working with our Sales Team to offer our products to the market. We will be training Raytheon’s Tech Support teams in early September, as Raytheon will be providing Tier One Tech Support of ICOP products, for their customers. ICOP is particularly proud to have Raytheon assisting with tech support, as their commitment to customer service is highly respected world-wide. It is important to note, that all ICOP products are being cobranded with the Raytheon logo. Every product will proudly display the words “Raytheon …powered by ICOP”. Then, beginning in late September, ICOP and Raytheon will officially launch our partnership with a national Road Show, holding breakfast meetings in nine cities across the country, to showcase our products to first responders in every region of the country. SecurityStockWatch.com: We understand you are making great progress in Mexico for your products. Can you tell us how you were able to access this market and how your products uniquely fit for this part of the world? Laura Owen: Yes, the Mexico market is a very promising one for us. The ICOP Model 20/20-W has proven to be a highly ruggedized unit, able to operate in high temperatures and rough terrain making it a good fit for that part of the world. In addition, it has a multilingual capability, enabling the unit to function in Spanish, an important requirement for the growing market needs in Mexico. Laura Owen: Earlier this year, we announced a sale to the Ministry of Interior in Saudi Arabia. Our Engineering Team worked diligently to “Arabize” our products. Furthermore, we worked collaboratively with a license plate recognition company, to provide a turn-key integrated solution. Together, we offer the only Arabized mobile video and license plate recognition solution on the market today. The Ministry of Interior tested 10 of our units for a full year before placing their initial order. Working with our Middle East distributor, we are currently completing the installation of the first 100 units across the country, while simultaneously training officers using the systems. This project provides the first in-car video systems ever purchased, in Saudi Arabia. News of the award by the Ministry of Interior was heard throughout the Middle East, generating a lot of momentum for ICOP. We are working very hard to assure absolute success for the Ministry of Interior. We have executives in Saudi Arabia this week, in discussions with the Ministry of Interior about the next phase of this project. The market potential in this region is very significant. SecurityStockWatch.com: We understand that in addition to Raytheon, ICOP has strategic relationships with Dell and Sprint. Please tell us more. Laura Owen: We secured our relationship with Dell earlier this year to supply our customers with servers for the back-end software that is sold in conjunction with our mobile video solutions. These two software options, called ICOP iVAULT™ and ICOP DVMS™,, allow users to securely store, manage, copy, and share video evidence files. Providing Dell servers ensures quality and reliability for our customers. The Sprint relationship is a co-marketing relationship, meaning we make joint sales calls and participate in trade shows together. Sprint does not sell ICOP products, and ICOP does not sell Sprint products. However, our joint messaging promotes a value-add for both companies. For example, ICOP LIVE is capable of utilizing the Sprint Mobile Broadband Network, providing real-time situational awareness through the live streaming of video. SecurityStockWatch.com: Let’s turn to a quick financial overview for a moment. ICOP showed a hockey stick momentum in revenue since inception in 2002, until late 2008. Would you attribute this change to the shift in the economy? What would you like the financial community to know about ICOP as we head into 2H 2009 and 2010? Laura Owen: Unfortunately, every industry seems to have suffered as a result of the challenges in the economy. However, we believe things are beginning to improve, as our pipeline is strong for the third and fourth quarters. ICOP’s win ratio on bids is over 50%, and our reorder rate from agencies is 63%. ICOP has a large pipeline of agencies that have begun outfitting their fleet with our products. These agencies purchase additional units as funding becomes available. The much anticipated Stimulus Funds are expected to begin flowing soon to law enforcement. We are in good position for these funds, due to our advance work in preparing agencies with information about the various funding programs available. And there is no question that the Raytheon partnership is a change agent for ICOP – both for the credibility that this brings ICOP, in addition to the expanded national and international sales effort in promoting ICOP products. The demand for security products, most notably mobile video products, is on the rise worldwide. ICOP is well positioned with our diverse product suite, to meet the growing demands of these markets, as we head into the second half of 2009 and into 2010. SecurityStockWatch.com: Thanks again for joining us today, Laura. Are there any other subjects you’d like to discuss? Laura Owen: From day one, ICOP has taken great pride in making all of our products, and the resulting video evidence, the highest quality in the industry. There was an interesting case that took place in Texas about a year ago. A local citizen stole a Sheriff’s K-9 vehicle for a joy ride. A high speed chase ended with the high-jacked Sheriff’s vehicle plowing into the back of a local police vehicle. That police vehicle had a competitor’s video system installed, and it stopped working on impact. The stolen Sheriff’s vehicle rolled, caught fire, …and the K-9 was killed. The vehicle was so badly damaged; it was hardly recognizable as a law enforcement vehicle. However, the ICOP digital video recorder, that was in the Sheriff’s vehicle, never stopped recording. In fact, the recorded video was used to help convict the perpetrator to 72 years in prison. So you see, these words are much more than a company slogan - quality matters, because quality convicts. Thank you for the opportunity to share the ICOP story today. ICOP has a rock solid foundation, and now, partnered with with you new partner, Raytheon., a world-class company, we are excited about our future!